Medium Kamui Leather Layered Tip. The KAMUI™ tip consists of 100% pig skin. During our unique manufacturing process, we utilize a lower chemical content to maintain a higher porosity in the pig skin. More Chalk. 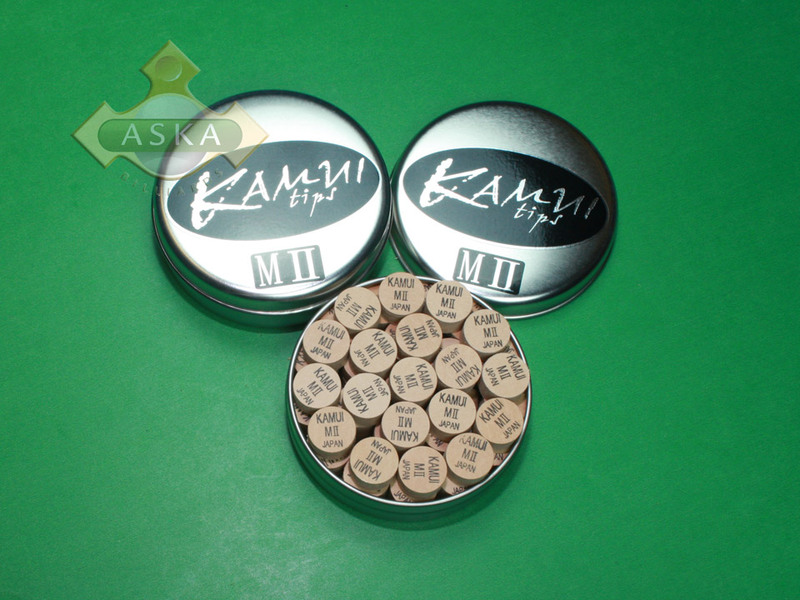 Kamui™ tips hold more chalk because it has a higher porosity than competitors. More chalk returns less miss cues. Less Mushroom. A cue tip with less porosity lacks the ability to “come back” to its original shape and will harden quickly. Because Kamui™ is 100% pigskin some mushrooming is inevitable, but our process allows the tip to return to normal shape after play, providing longevity. More Longevity. Pool is a mental sport. Changing your “weapon” can change your game. KAMUI™ will maintain its characteristics of play longer because of the high porosity. More Control. Increased spin on the cue ball means increased control of your play. Our tip provides the ability for more spin with less force. With other tips, the need to exert more energy causes a loss in control of your body movement and aim precision. KAMUI™ will afford you a reliable cue speed with the benefit of maintaining cue ball distance. In other words, you will make long follow and draw shots with less cue ball speed and more accuracy. More Pockets. Because the KAMUI™ tip affords the luxury of spin with a lower ball speed, you are more to pocket more balls. A slower traveling object ball will easily drop in the pocket as compared to a higher speed object ball. More Reliability. You can hit more center-side with the KAMUI™ tip, limiting miss cues. More Coverage. The added spin our KAMUI™ tip will bring the cue ball offers longer distance with less speed and more precision. More Friction. Holding more chalk equates to more friction therefore more “grip”. More Value. KAMUI™ simply offers more for your money. More accuracy, longevity and therefore more value.